The EcoHitch® hidden hitch for the 2014-2018 BMW i3 is designed to be completely concealed so you only see the receiver once it's installed rather than having to see an unsightly crosstube underneath your vehicle. Rated for 200 pounds tongue weight, this i3 trailer hitch helps you command the road with the confidence that comes with driving BMW. *If you’re going to be towing and need trailer wiring, click here! Ensure your wiring harness does not drag on the ground by visiting our Eclipse trailer wiring bracket. The BMW i3 goes beyond utility and will change the way you think about driving. We manufactured the perfect hitch for the BMW i3 that does the same by balancing with the contours and naturally innovative design of your car, so you continue to have an efficient drive with the BMW i3 EcoHitch. The EcoHitch® hidden hitch for the BMW i3 comes in both 1¼-inch and 2-inch receiver sizes so you get your choice of which bike racks and cargo trays will work best for the receiver you choose. Made from recycled metals, the BMW i3 hitch is eco-friendly and lightweight. With 200 pounds tongue weight capacity, our BMW hitch makes a perfect travel companion for a car where green still means go. 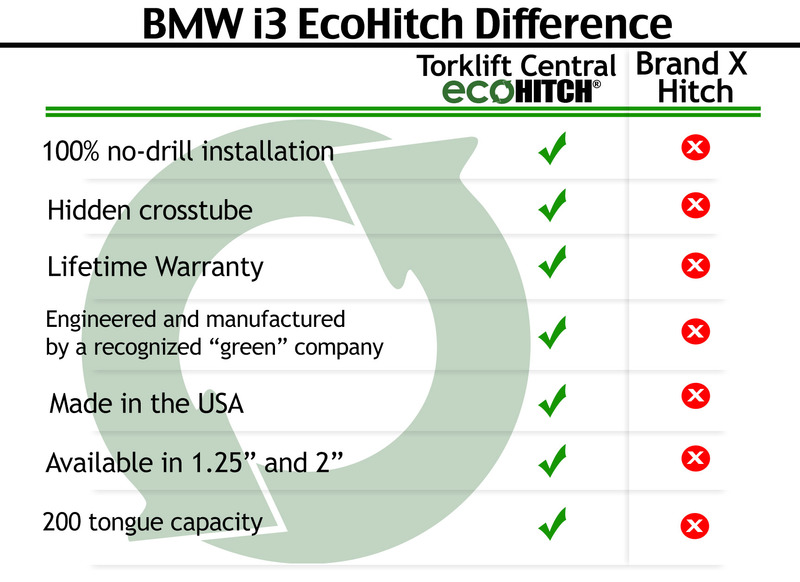 *EcoHitch part numbers X7277 (2 inch) and X7278 (1.25 inch) are compatible with or without the BMW i3 Range Extender.